In 1936, the Post and Telegraph Department (P.T.D.) in Latvia initiated a program of stamping public service messages on cards and letters. These messages, or postal slogans as they could be called, were all in the Latvian language and provide us with insights into cultural events, tourist areas and the agricultural life style of a great portion of the Latvian people. Usually, with some exceptions, the slogan text appears within a rectangular frame. For these rubber hand stamps blue ink was to be used. The stamps had to be applied, as clearly as possible, on the front side of all local and domestic outgoing ordinary and registered mail (letters, postcards, printed matter and small packets). It was also stated that the stamps had to be applied near the date stamp and in such a way that the delivery address still was readable. In rare cases applied stamps are seen in black or red - obviously depending on the shortage of stamp ink at the post office. Slogan hand stamps are also sometimes found on foreign mail - probably by mistake of a post office employee. The expressly stated instruction using the stamps on outgoing mail only has not always been followed. Many examples on envelopes or postcards are seen, with hand stamps applied, where the date stamp is from a smaller Post Office. However, these are mainly sent to Riga and indicate the use also on incoming mail. In rare cases are items sent between two smaller Post Offices found where a Hand Stamp is applied indicating that also transit mail had been stamped with a slogan. To be safe that the use of the Hand Stamp is from a special town or Post Office you have to look for local mail items or mail sent to small places. In rare cases you also can find items with 2 Slogan Hand Stamps. This can be either two impressions of one and the same stamp or two different Slogans from ensuing usage periods. Totally 45 hand stamps were delivered to 29 different Post Offices but after 07.03.1937 there were 10 more delivered to Riga Main Post Office. 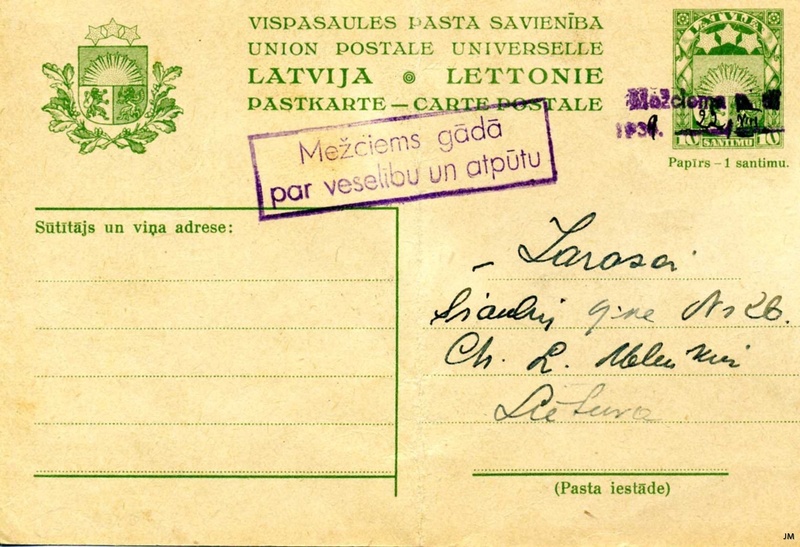 "Until further notice the post offices of the following health resorts shall apply their own local promotion slogan marks on outgoing domestic mail, in which case other standard hand stamps not shall be applied: Ķemeri, Sigulda, Ogre, Baldone, Majori, Melluži, Liepāja, Kandava and Mežciems." The P.T.D. order No 71 points on the usage of health resort hand stamps from June 19th 1939, but the order No 121 of October 7th tells to interrupt the application. Many of those stamps seen are from the first days of the period for usage, mainly Midsummer greetings postcards. However, the Ķemeri hand stamp (No. 30) has been used through the winter 1939/40 until at least August 12th 1940. Several of the postal slogan marks from these health resorts are very rare. Especially the stamp from Mežciems is seldom seen. Originally the thought was that the text in this stamp was: ”Pavadiet vasaru Mežciemā!” but then a different stamp appeared with the text: ”Mežciems gādā par veselību un atpūtu”. Comparing these two stamps it is easy to see that the letters in the first one differs a lot from the other one’s of these health resort stamps. Furthermore is the standard postmark on the first item manipulated – a postmark with index letter “L” is not known from Mežciems and is never used at Mežciems! At Mežciems was only a postmark with index letter “A” in use. In September 1939 this postmark was engraved and the segment bars were amended. The second hand stamp is also found on a Postal Stationery with a temporary marking of Mežciems from the period when the ordinary Mežciems postmark was sent to the workshop for engraving (see illustration below). Furthermore an item with Daugavpils cancellation is found. This is possible as Mežciems is a health resort in the border of Daugavpils. According to these facts it can be stated that the first slogan found (”Pavadiet vasaru Mežciemā!”) is a forgery. Different other forged Hand Stamps have been found and not only from the rare ones. These forgeries must not be mixed up with the varieties. As it is a question of rubber stamps it has been easy to produce stamps very similar to the origins but by a careful examination differences appears. Small varieties by the different hand stamps are found. This is not astonishing as the stamps were manufactured of rubber and because of that difficult to produce them identical. 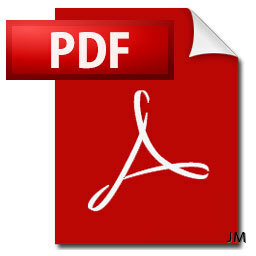 On request I can deliver a separate pdf-file where the differences (known as so far) are described. In second part of the 1930ies also different slogan hand stamps from different companies or authorities are found. These were not ordered by the postal authorities. Known unofficial hand stamps are shown in the separate pdf-file below.